Candy Stripe peony is the star of the bouquet! Becky asked if I would take a picture from my angle versus the angle she has been doing for Facebook and Pinterest. Well, see what you think and from my angle not only did her bouquet turn out great but perhaps I do have some creativeness in my shooting angles? Most of my 8,000+ shots during bloom time are to record new peony registrations and provide new material for next years website. Perhaps you saw me during Peony Field Days running through the rows of peonies shooting like a wild man before the storms and high temps blew out the blooms. Most of my shots are for ‘factual’ reasons versus ‘creativity’. It is nice though to slow down and enjoy a shot like this! Candy Stripe is amazing in bouquets as well as in gardens. Those attributes are the main reasons that Candy Stripe is one of our top five sellers every year. Candy Stripe was Roger Anderson’s first registered peony. Little did he know that decades latter, Candy Stripe is still not found in most gardens. Perhaps this is the year that you will add Candy Stripe to your peony garden? 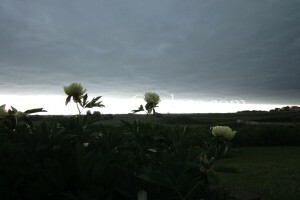 The eye of the storm over an intersectional hybrid peony…again! For those of you who ventured out to our 2016 Peony Field Days, THANK YOU! From slugging through the mud to get to our peony fields on June 3rd and 4th from the May 23rd storm to embracing 90 F degree temperatures on June 10th and 11th, thank the good Lord that we didn’t have an encore today as last night we had another 2″ of rain. As you can see in the picture before the storm hit, Bartzella whispered to me, ‘not another one’! As we mentioned to those of you at Peony Field Days, ‘when we say no staking in the description, we really do mean it’! What a sight at 7:30 PM to go from sun to darkness in a matter of minutes. Moments latter the downpour began and ‘Bart’ held strong through another battery of wind. Oh and the great news, our driveway is still intact! No flooding out like the May 23rd storm that dumped 6+ inches of rain in 3 1/2 hours. Here is a quick summary of our 2016 Peony Field Days. 2,100 peony admirers attended over the 4-days we were open. NO boots, shoes and sandals were found in the muddy hay field. Bartzella, Hillary, Candy Stripe, Garden Treasure and Joanna Marlene were our top five sellers. We just loved Peony Field Days this year as all of you were troopers knowing the extreme weather conditions we’ve faced. It was also encouraging to see and talk with the children that came out. Yes its nice to collect our peonies but to pass that on to the next generation is a milestone all of us gardeners face trying to compete against a smart phone and a screen that still isn’t scratch and sniff! Our hope is that all those children will remember the sights and smells of intersectional hybrid and garden peonies for another generation! 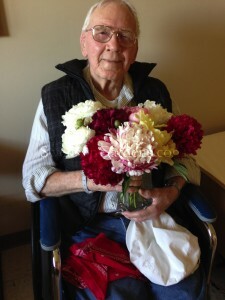 At 91 1/2 years old, my dad still LOVES peonies! We brought some up for him as he is no longer living at his home where some of our peonies adorned his lawn. Many days were spent attending to his gardens and yes he kept a calendar of when each variety bloomed every year. He was the talk at his long term care residence now and proudly told everyone about his family’s peony farm. What a joy and honor to see him smile like the staff has never seen him smile before. Please, please if you have family and friends at long term care facilities, bring them a bouquet of fresh cut peony flowers! The generational bond of peonies is something many of the elderly will never forget! We love you dad and thanks for the memories of your peonies! We have been receiving numerous calls and emails regarding the bloom time status and field conditions for our Peony Field Days. These photos were taken early this morning after 1/2″ of rain fell, again, last night. As of this morning, here is my opinion on color in the fields, 40% are done, 40% are at peak or soon to be peak and 20% are still in the bud stage. Now going back to my previous post of extreme weather conditions in 2016, can you say HOT for June 10th and June 11th? With the forecasted 90 F+ degrees over the next three days, my guess is this extreme heat will increase the likelihood of the remaining 20% to bloom. And YES we will be open during this abnormal heatwave and NO we will not be rescheduling to a cooler day. As Minnesota, Wisconsin, Iowa, Nebraska, South Dakota and North Dakota gardeners, it is what it is. Please, please though be careful if you are not use to this extreme heat, humidity and the high heat index! We want all to be safe during these conditions! With the rain last night, I would recommend boots to get to this field as the previous flooding left the ground very muddy and it has not dried out as of yet. For those of you who were here on June 3rd and 4th, THANK YOU, but also many of the gardeners finally gave up trying to get to this field with boots, shoes and sandals only to revert back to their childhood by removing footwear and yes, bare feet! Now was that fun or what? So maybe our policy of ‘shoes are NOT required for business’ may be in order! Intersectional Hybrid Peonies are at peak bloom! These are my all time favorite blooms during the growing season. What is an Intersectional Hybrid Peony? These were originally developed by Mr. Toichi Itoh from Japan and some of the seeds were transported to the United States by Mr. Louis Smirnow and registered in the mid 1970’s. Then, United States hybridizer’s like Roger Anderson from Wisconsin, were able to successfully make this same cross between the two sections of peonies, ‘Moutan’ or ‘tree peony’ provided the pollen parent and ‘paeonia’ or ‘herbaceous/garden peony’ provided the pod parent. The child that was then born by a seed from the pod parent gave us today’s Intersectional Hybrid Peony. Some growers also refer to them as Itoh hybrid peonies. Much hardier and faster growing than a tree peony, intersectionals provide tree peony blooms and foliage with herbaceous/garden peony stems. The majority of our intersectionals are at peak bloom during Peony Field Days on Friday, June 10th and Saturday, June 11th from 9 am to 5 PM. 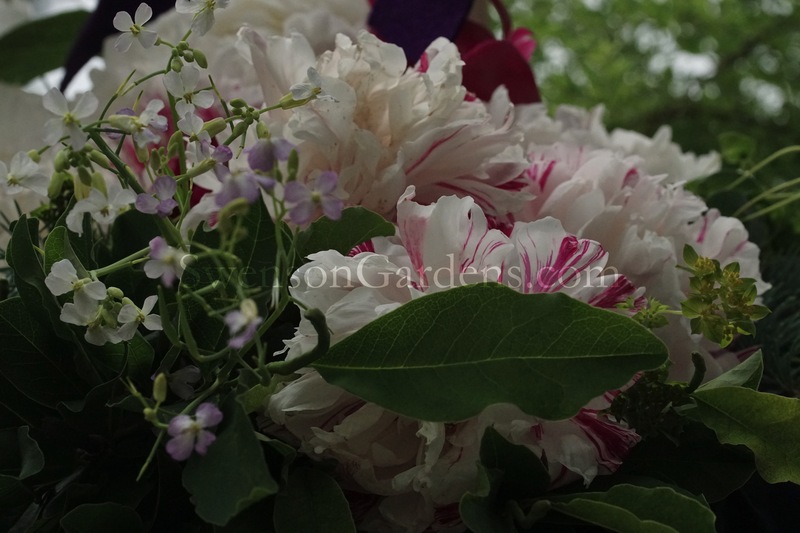 See you at SwensonGardens.com 2016 Peony Field Days! 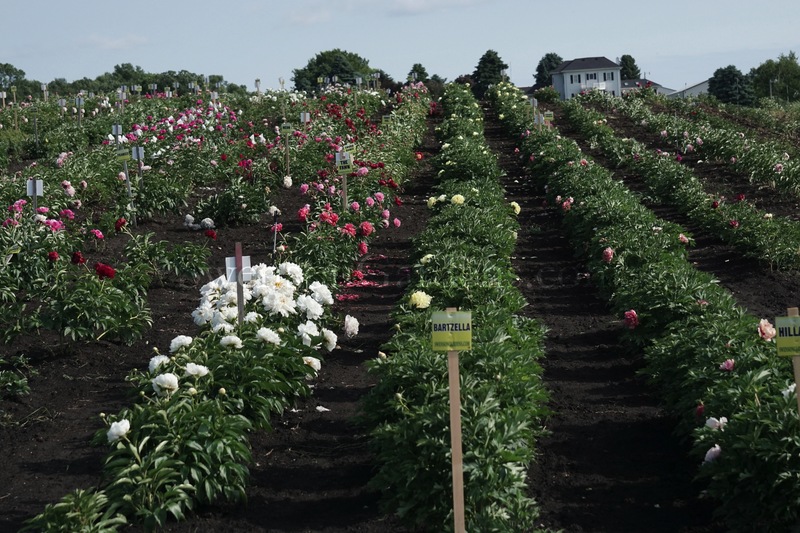 Swenson Gardens Peony Field Days – June 10th and 11th from 9 am to 5 PM! For those of you who are new to SwensonGardens.com, welcome to information on our upcoming Peony Field Days! If you peruse my previous posts, 2016 has been the year of extreme weather conditions here in Howard Lake, MN. 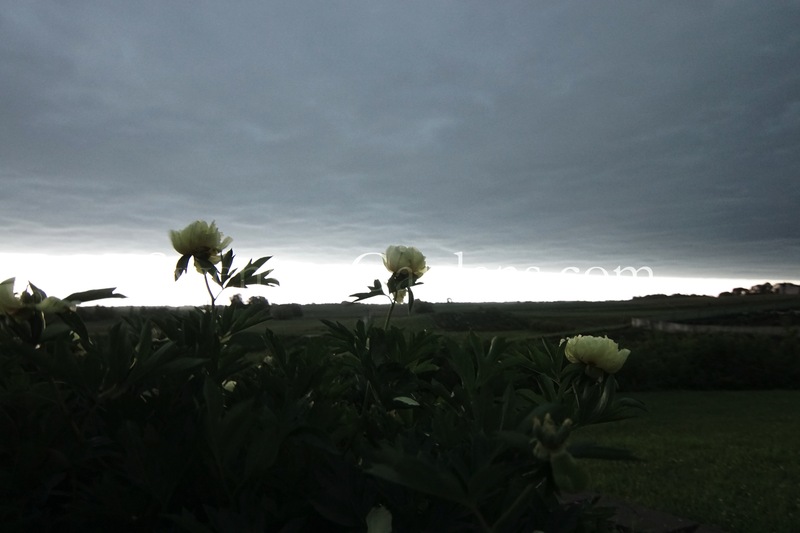 Thankfully the great Lord has watched over our peony fields and spared us from what could have been only a mile north of here during the May 23rd storms. There they had shovel-able hail and much stronger winds than the 53 mph we had here. When we say most of our peonies are ‘no staking’, believe me we’ve experienced that in our fields. With over 6 inches of rain during that week, major damage and flooding was done to our driveway and hay fields but our peony fields were high and soon to be dry again after the 1/2″ of rain last night. Peony Field Days is a chance for you to experience our peonies in some of our growing fields. We are not a nursery but the worlds largest chemical free bare-root peony grower. All our fields are chemical -free and maintained the old fashion way with a 1948 Planet Junior cultivator, winged weeders and yes on hands and knees pulling weeds. Our fields are a labor of love, most of the time, and open them up to the public on Friday, June 10th and Saturday, June 11th from 9 am to 5 PM. WE ARE NOT OPEN SUNDAY, JUNE 12th! Saturday, June 11th will be our final Peony Field Days for 2016. Since 90% of our business is web based, we thought opening up our fields to the public, a few days during peak bloom, would be a chance for you to enjoy our fields. Ordering our bare-root peonies can be accommodated onsite during Peony Field Days for pick up in the fall or we can ship them to you in mid-September, which by the way, is the best time to plant peonies in their dormant bare-root stage versus planting potted peonies, from who knows where they were grown, in the spring. Staff will also be available to discuss peony care and growing tips. Our address is 10958 70th St SW, Howard Lake, MN. Staff will direct traffic for parking on arrival and a portable rest room is onsite. We will do our best to accommodate those that are physically challenged and will offer suggestions knowing that wheelchair and walker accessibility is limited due to the flooding of the hay field that you would have to negotiate through in order to get to our peony field. One of the options is do to a drive by tour from our driveway. Make sure to bring your cameras and as usual, dogs are very welcome here if kept on a leash. We look forward to seeing you at Swenson Gardens Peony Field Days on Friday, June 10th and Saturday, June 11th. Here are the facts for Peony Field Day on Saturday, June 4, 2016. Wet and muddy conditions are the norm from the additional rainfall yesterday afternoon. Not hip wader footwear but definitely boots are in order for those who brave the field conditions. Parking will be determined as the day develops so please be patient with the attendants. If you do chose to come out today, might I suggest early afternoon instead of this morning? We are open until 5 PM. Perhaps the ground will dry out some more this afternoon versus arriving here at our 9:00 am opening. Us bloggers are the informed ones, right? The other option is to postpone your visit until June 10th and/or June 11th during our next Peony Field Days. With the peony field at 20-25% color, the peak bloom is still a week or so away. Many of the intersectional hybrid peonies are now starting to bloom. With the garden/herbaceous peonies, I’ve given up trying to categorize blooms by early, mid and late! What a weird bloom season! Yes the early’s are pretty much done and then the bloom progression is supposed to follow? Well Candy Stripe decided to start opening yesterday which is NORMALLY a late bloomer. The vivid color of the herbaceous hybrids are prime for viewing from our driveway so if you are unable to walk in the mud, its still worth it to drive up and down our driveway. Hopefully and prayerfully, the fields will dry out for the June 10th and 11th Peony Field Days! Address again is 10958 70th St SW, Howard Lake, MN. This is the final post for Peony Field Days on June 4, 2016. We are closing Peony Field Days as of now for Friday, June 3, 2016. Thank you for those who braved the rain, wind and muddy conditions up until now. The fields are way too muddy and with threat of severe storms now eminent, we want this to be an safe and enjoyable experience for all. 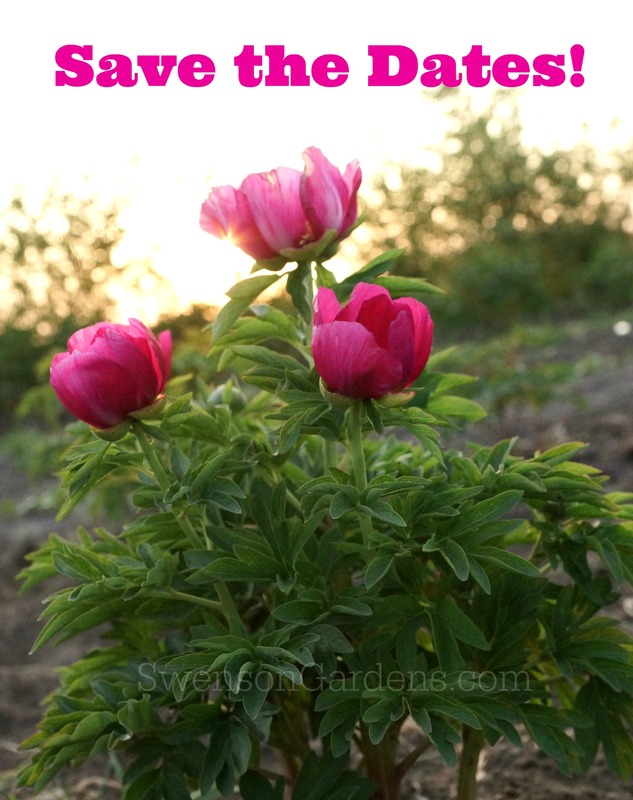 Check back early morning on Saturday, June 4, 2016 for status of Peony Field Days that day. We are opening at 9:00 am this morning, June 3, 2016 for our Peony Field Day. Will post any changes if/when weather changes but for now we are rain and storm free! Our plans are to stay open as long as we can up to closing time at 5:00 PM. Safe travels to our Peony Field Day. 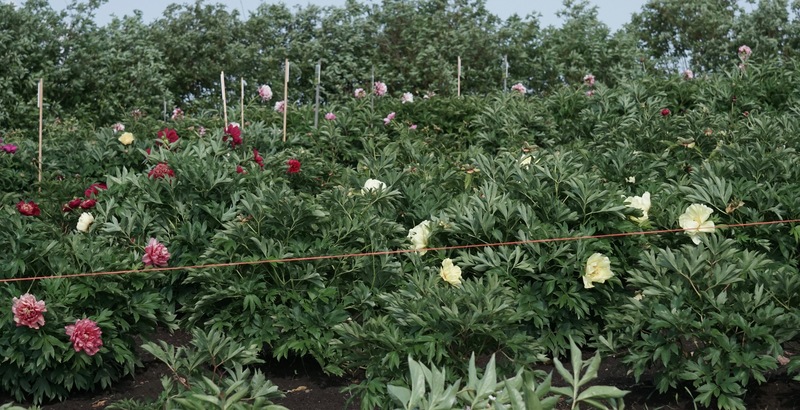 At least there isn’t snow in the forecast for our Peony Field Days today! The term that comes to mind is ‘abbreviated’. We are still planning on opening at 9 am today until further weather conditions warrant a change. Please check back for updates to our June 3, 2016 Peony Field Days. I’m not sure if this link came over from YouTube regarding our upcoming Peony Field Days for June 3rd and 4th so if it didn’t link in our blog, search (and subscribe as well to our YouTube Channel) ‘2016 SwensonGardens.com Peony Field Days’. This video was filmed around 6:00 PM tonight by our capable video editor, Ben. As you can see as of now, we are at 15-20% color. The team has tried to do their best in getting the fields ready and based on where we were at a few days ago, they have done an amazing job! And yes they all received Blizzards from DQ when they finished. I guess being ALL chemical free has its advantages! Right team? Not to be redundant but, as of now, the fields are walk-able and parking area is firm. I say as of now because you know what the forecast is tonight and tomorrow so we are praying that the storms will be parted and leave us high and dry. For those of you who have emailed and called regarding our previously washed out driveway, it is repaired and for those of you who want to stay in your vehicle, there is a turn-a-round on top of the hill past our home. With the wet conditions between our driveway and canopy, we will not be able to accommodate parking next to the canopy for those who are physically challenged and/or need wheel chair accessibility. As of now, even before the forecast, you will need boots in order to walk through this field. Some portions, as of now, are dry but the north and south end are very muddy from the flooding. Our old peony field east of our driveway is drier, as of now, for walking. There are a few varieties there that are not in our west field. Most of them are on the far eastern side which leads you past our pond. Make sure to stay on all the areas of grass that are mowed unless you would like to leave an assortment of boots, shoes and sandals for us to claim sometime this summer! We will post on our Blog and Facebook for any changes to June 3rd and will have a recorded message at 763-350-2051. Safe travels to our Peony Field Days!